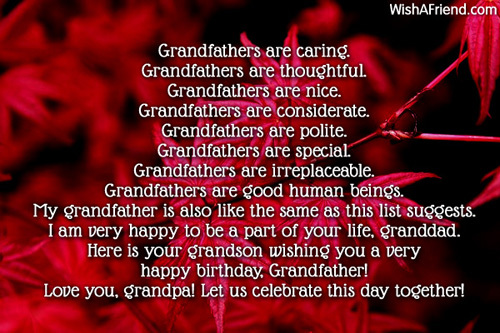 Need some good Birthday wishes to send to your grandfather, find them right here. 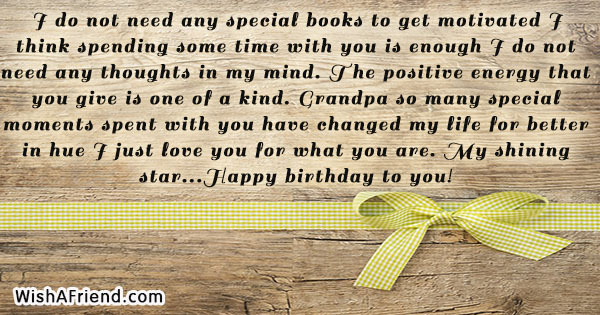 Share the Birthday wishes with your grandpa via Text/SMS, email, Facebook,Whatsapp, IM, etc. 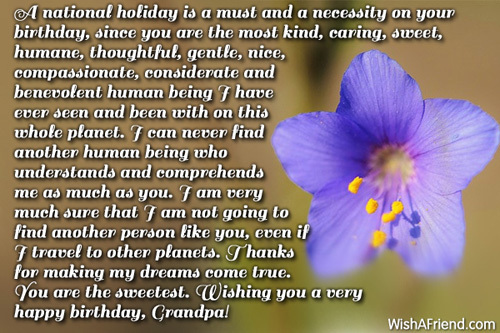 A national holiday is a must and a necessity on your birthday, since you are the most kind, caring, sweet, humane, thoughtful, gentle, nice, compassionate, considerate and benevolent human being I have ever seen and been with on this whole planet. I can never find another human being who understands and comprehends me as much as you. I am very much sure that I am not going to find another person like you, even if I travel to other planets. Thanks for making my dreams come true. You are the sweetest. 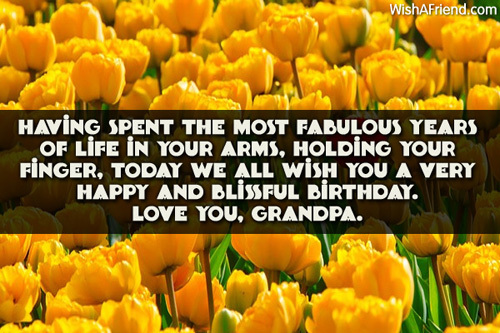 Wishing you a very happy birthday, Grandpa! All grandfathers are sure to love their grandsons but I bet no one can love like the way you love me right from my childhood days. You are not just a grandfather to me. You are a good friend and a guide to me. You are someone who is extraordinary. 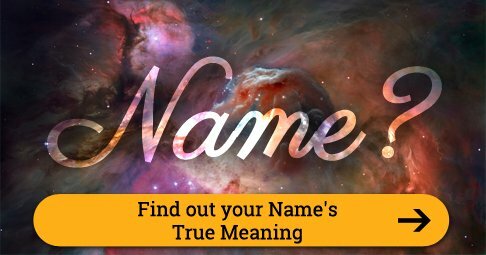 This day is also unique and special like you. 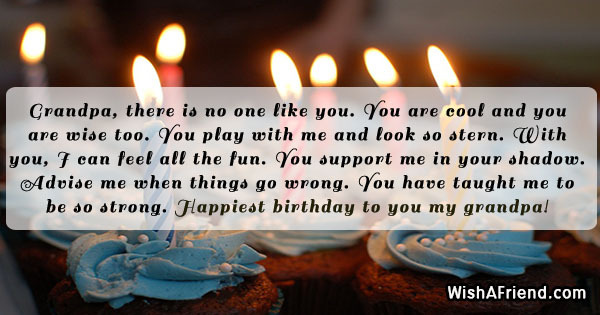 It is your birthday and I want you to make a wish today. It might be anything for that matter of fact. I am going to try and make it come true today. 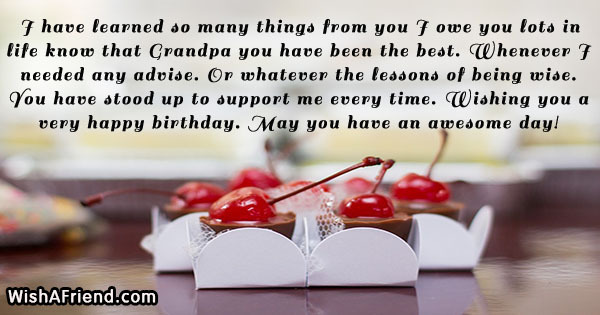 Happy birthday to my dearest grandpa! 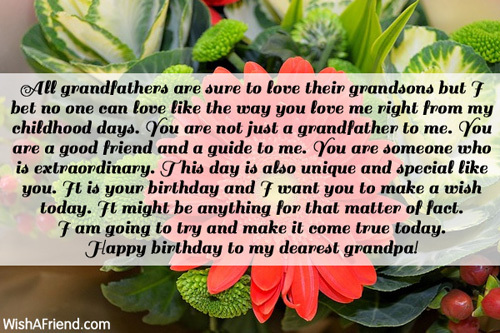 Grandfathers are good human beings. 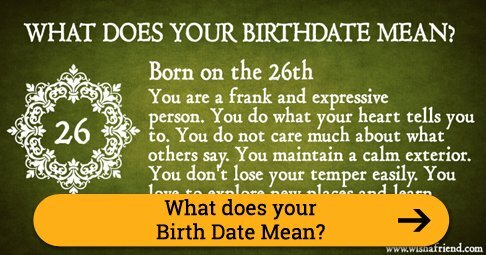 My grandfather is also like the same as this list suggests. 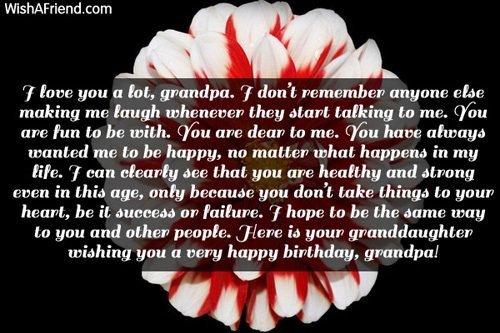 I am very happy to be a part of your life, granddad. 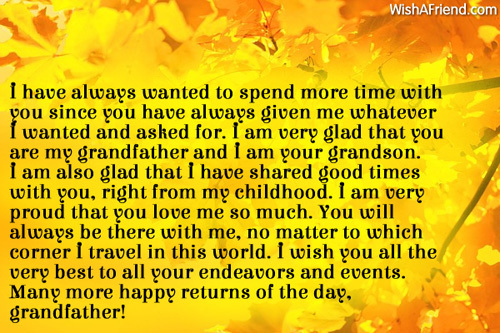 Here is your grandson wishing you a very happy birthday, Grandfather! Love you, grandpa! Let us celebrate this day together! 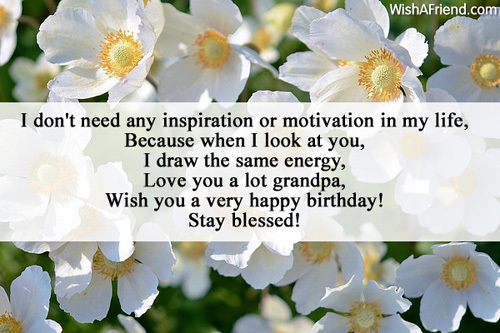 Happiest birthday to you my grandpa! I always have admired and marveled at you. I admire the way you devote and dedicate yourself to any work that you do. I admire the way that you pray to god whenever someone is in need of help. 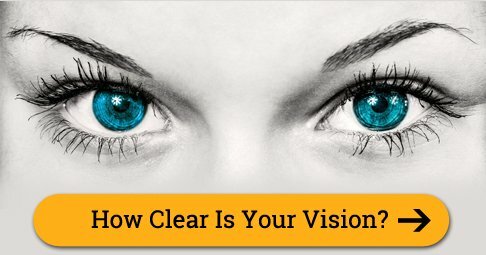 I know that you want everyone to be happy and blissful. I respect you and your values. I promise to follow your principles all through my life. Thanks for being this way. 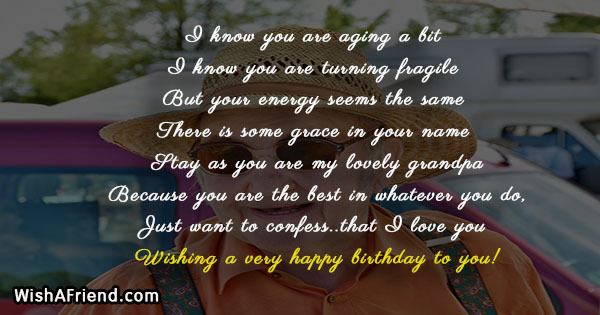 Here is your dearest grandson wishing you many more happy returns of the day. 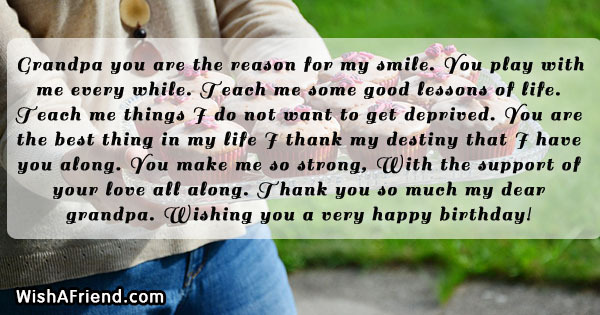 My shining star...Happy birthday to you! I grew up with you. I grew up with your values. I grew up with your standards. I grew up with your meaning for life. I grew up with your confidence. I grew up with your love. I grew up with your guidance. I am so proud to have you in my life. You have helped me a lot. 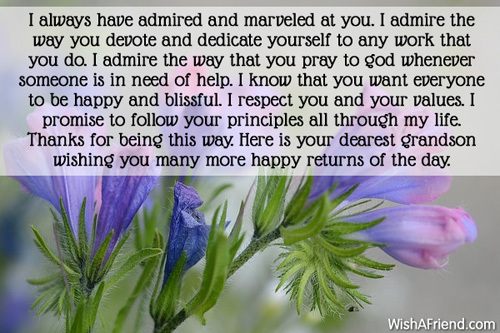 You have helped me to gain strength and power to do things in the best possible manner. I thank you for everything. 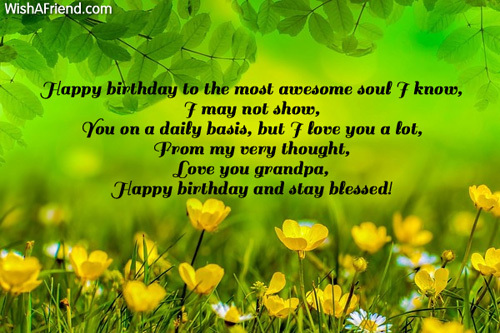 Here is your darling granddaughter wishing you a many more happy returns of the day. Happy birthday to the bestest grandfather! You Rock! I have always wanted to spend more time with you since you have always given me whatever I wanted and asked for. 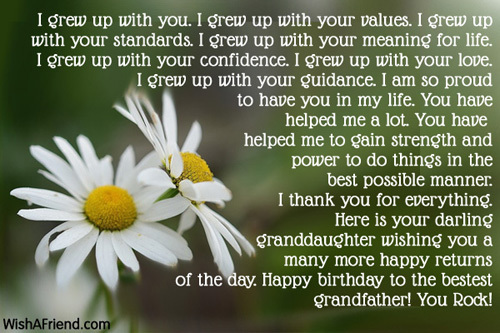 I am very glad that you are my grandfather and I am your grandson. I am also glad that I have shared good times with you, right from my childhood. I am very proud that you love me so much. You will always be there with me, no matter to which corner I travel in this world. 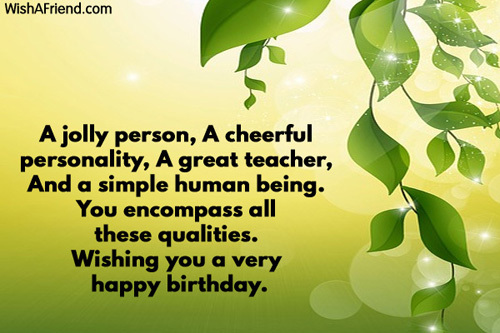 I wish you all the very best to all your endeavors and events. 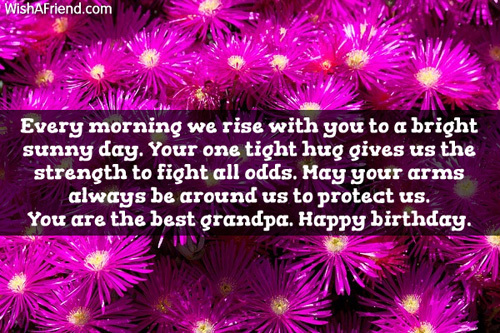 Many more happy returns of the day, grandfather! I love you a lot, grandpa. I don't remember anyone else making me laugh whenever they start talking to me. You are fun to be with. You are dear to me. You have always wanted me to be happy, no matter what happens in my life. I can clearly see that you are healthy and strong even in this age, only because you don't take things to your heart, be it success or failure. I hope to be the same way to you and other people. 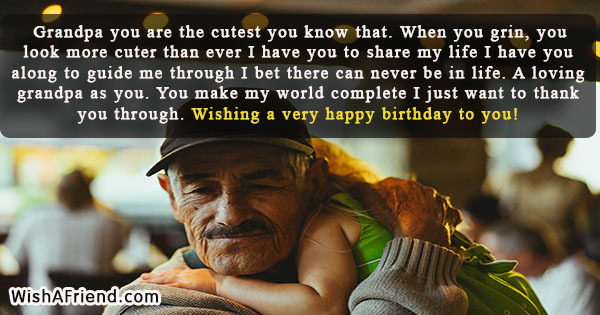 Here is your granddaughter wishing you a very happy birthday, grandpa!